I donned the watch, which hits Australia in the coming months, and played with its features for a few minutes in a crowded press room under less than optimal conditions. That said, I don't see myself ever owning a Galaxy Gear. The 1.6-inch Super AMOLED screen is beautiful. I felt like Inspector Gadget when I glanced at my wrist. But the display and plastic strap are massive. Wearable tech continues to struggle to appeal to all types of people, because it has to be comfortable, stylish, and small. If you have tiny wrists, the Galaxy Gear is not for you. 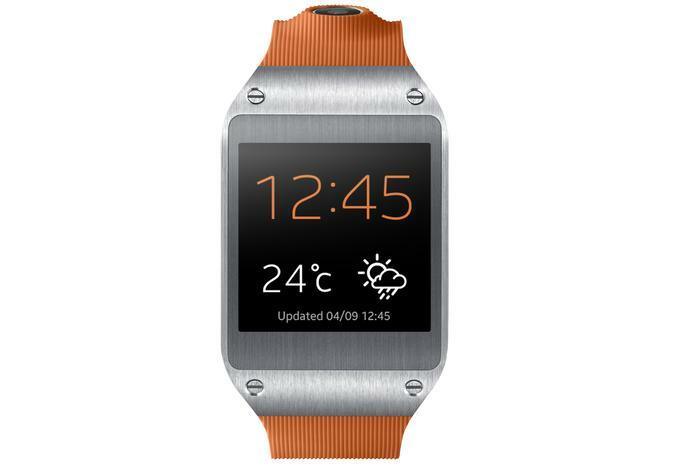 Several people commented on the fact that the Galaxy Gear looks like those iPod nano watchbands that were en vogue a few years back. It's a fair comparison. The Samsung watch's display is definitely more rectangular than the Nano watch, but the glossy black display just feels like wearing a mini-smartphone. The watch responds like a smartphone, too. Swipe to the left or right to access different screens, like your notifications, clock, apps, and more. Swipe down to return to the previous screen. The Gear is quick, like a phone. But it's an accessory. That much is obvious. Samsung is tying the Gear to the Note 3: "Better together" is the duo's tagline. But hundreds of millions of people own Samsung devices that aren't the Note 3, and they can't use Galaxy Gear. That exclusivity severely hinders Gear's potential. The company said it plans to widen the Gear's compatibility with other Samsung devices, specifically the Galaxy S III, Galaxy S4, and Note II, but reps couldn't provide a timeline for that roll-out. The watch has apps galore: Path, Runtastic, Glympse, Line, Vivino, and more. But none of the majors are there. Instagram? Nope. Vine? Nuh-uh. Facebook, Twitter, Gmail, and news apps for browsing the latest headlines are all missing. Anything I would want immediate access to--you know, without digging my phone out of my bag--I can't get to on Gear. It seems like it would work well as a pedometer tied to Samsung's S Health tracking features, but US$299 is an awful lot to pay for a glorified health tracker. You can answer calls with Gear--it has a speaker--but you have to hold the watch up to your ear to hear the person you're calling, thereby irritating everyone around you. You can also respond to messages, but only as a voice-to-text memo. I didn't get to test that feature, but voice-to-text is notoriously poor. I can't even trust Siri to understand my clearly enunciated dictations. The Gear has a few cool features. The 1.9-megapixel camera, located on the north side of the watch strap, allows you to take undercover photos. It just feels awesome. The camera also shoots videos--neither camera nor video quality is very good compared to the smartphone, but that's to be expected. Pebble proved a smartwatch is possible. Sony paved the way. Samsung has thrown down the gauntlet. Apple: It's your move now.